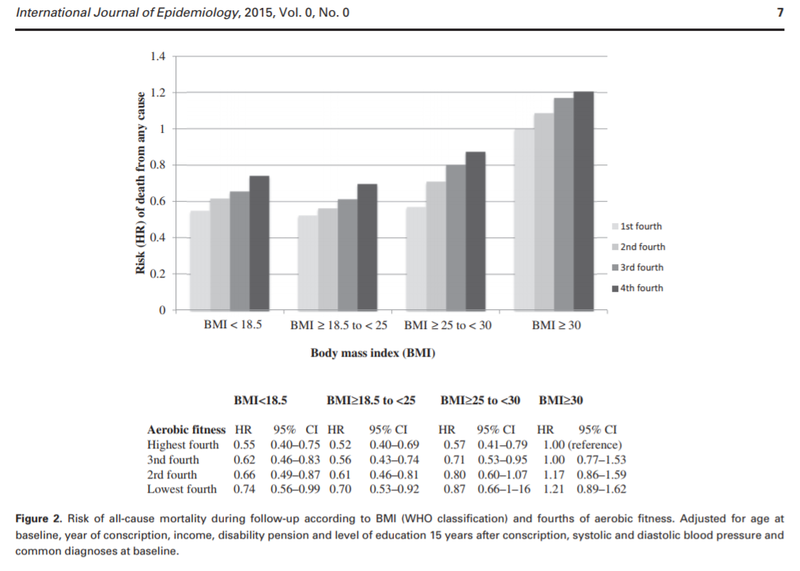 This post discusses a few studies on BMI and body composition and CVD mortality. 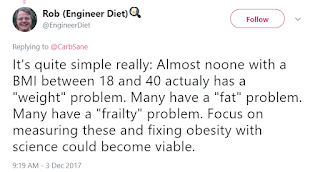 It was prompted by a Twitter conversation wherein Rob made claims regarding frail obese people, and that obesity science must address body composition to move forward. 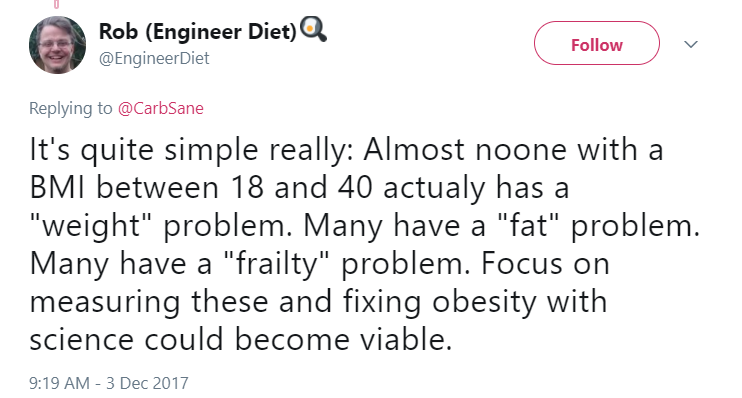 The idea being that people with BMIs up to 40 don't have a "weight" problem, they have a fat problem, and the solution is to gain more lean mass then lose fat mass whether or not there is net weight gain/loss/neutrailty in the process. BMI is essentially a useless measure. There are a lot of people, particularly in the "strong women" and Healthy-At-Every-Size (HAES)/related communities putting forth a similar message, that weight doesn't matter, and the former, especially, promoting lifting heavy weights and "thickness". A sizeable proportion of people from just about every corner of the internet is fixated on the concept of preserving and/or building lean mass. Building lean mass -- in all contexts -- is promoted as healthy, and health protective. At worst, lean mass is benign. As a BMI outlier, I have considerable skin in this game so I got curious when presented with a study that showed reduced CVD mortality for those with high muscle vs. low muscle, irrespective of fat mass. There appears to be yet another one of those "obesity paradoxes" discussed in the literature. I'll discuss problems with that study as well as what kind of actionable information it provides in a future post. In short, once you have CVD and/or surgical intervention, your survival rate increases with increased adiposity and fat free mass. Those with the lowest fat seem to fare the worst in one study, while this is improved by higher FFM in another. What about developing CVD (or other diseases) in the first place? Heart disease rates are (seemingly universally?) higher among the obese (by BMI) than the lean. Is it ALL about just the fat though? Searching out the full text of Rob's article, other articles were suggested. Among them was this: Body Mass Index, the Most Widely Used but also Widely Criticized Index: Would a Gold-Standard Measure of Total Body Fat be a Better Predictor of Cardiovascular Disease Mortality? I think many will be shocked by, and perhaps scratching their heads over, the results here. This study of over 60,000 subjects followed up for an average of 15 years. They looked at BMI, %BF, FMI (fat mass to height) and FFMI (fat-free mass to height) and resultant CVD mortality. This study sure gives me pause, and fits in with what I've been thinking (and doing) for going on two years now regarding total weight: Should we worry so much about preserving "Lean Mass" in people who got obese on the SAD? Is being heavier healthy depending on body composition? The main study discussed in this post seems to indicate otherwise. I share some thoughts at the end. You can browser search on "My Thoughts" to skip to that if you like. Is a High BMI Relevant to Health Risk? I either get into discussions about BMI, or think about BMI quite a bit, because I have a high BMI-to-size ratio still. I'm much smaller now than I was at my current weight in my 20s, and I have saved enough odd pieces of clothing to know it's not clothing size inflation. I have generally considered BMI to be "useless" for individuals, because, you know, all of the ripped athletes with BMIs over 30. I also "run" in fitness circles on Facebook, and these are dominated by those who prioritize resistance training (several are and/or train strength or physique competitors). When it comes to weight loss, there are numerous lines of reasoning that all converge to the goal being as close to 100% fat loss as possible. Lean body mass is almost universally seen as a positive, or at the very minimum, benign. It's prime tissue, never to be lost without a dang hard fight to preserve!! Lastly, there are a number of female internet celebs (some objectively overweight/obese) who promote their healthy lifestyle including lifting heavy weights. Some will lament that their doctor doesn't care that they can squat XYZ lbs, while others actively promote getting thicker. I've seen again and again that rather than fat loss, perhaps it may be better to focus on muscle gains. The primary study I'm discussing here would indicate otherwise. Is a high BMI with low adiposity healthy? By healthy, I'll use my own comprehensive definition. Healthy as we age is being at a lower risk for chronic degenerative diseases "of aging" and a reasonable expectation to live longer. A healthy person possesses a wide range of biomarkers consistent the aforementioned risks and expectations. No pet biomarker adoption, while others go ignored. Where one can't pick their genetics, a healthy lifestyle fosters improvements or manages abberant biomarkers. Healthy is having the ability to be active and functional. And ultimately, healthy must include a mental state of well-being, because none of the aforementioned are much good if you can't sleep, are stressed out all the time, or cannot enjoy relationships with family and friends. 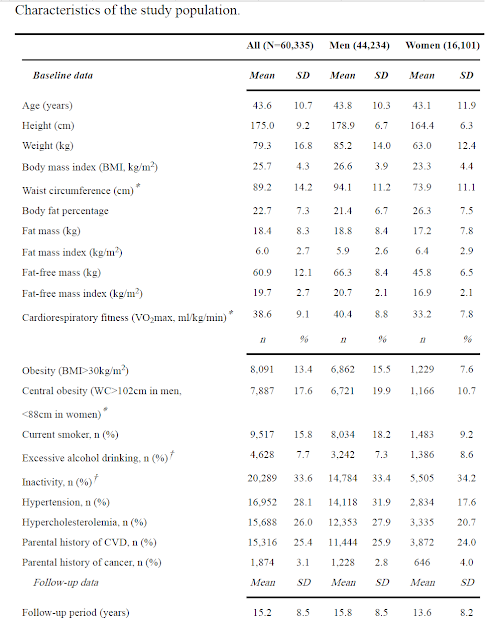 Body Mass Index, the Most Widely Used but also Widely Criticized Index: Would a Gold-Standard Measure of Total Body Fat be a Better Predictor of Cardiovascular Disease Mortality? This study followed over 60,000 people (roughly 44K men and 16K women) for an average of 15 years looking at cardiovascular disease mortality. The cohort was predominantly white (98%) professionals, and averaged ~43 years of age at baseline. Here is the table of all baseline characteristics. noting that for men, that is near the current classification for Class II Obesity (over 35) while for women it was just over the current classification for Class I Obesity (over 30). My point in stressing this is that "very high BMI" does not imply the severe obesity (over 40) that is present in over 5% of the current US population! In other words, the risk ratios found in this study could be way worse if it had started at the turn of the century. Compared with a medium BMI, a very high BMI was associated with a hazard ratio (HR) of 2.7 for CVD mortality. 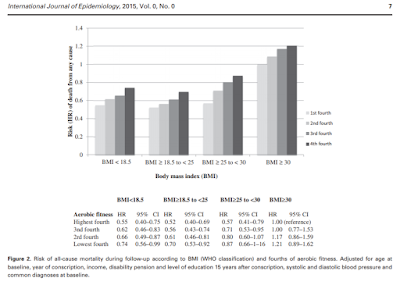 There was a stronger association for BMI than for BF% (HR=1.6) or FMI (HR=2.2). Compared with a medium FFMI, a very high FFMI was associated with a HR of 2.2 for CVD mortality. These estimates were markedly smaller for FFM (HR=1.2). When the analyses were restricted only to the sample with hydrostatic assessments (N=29,959), the results were nearly identical, with even slightly larger differences in favor of BMI (HR=3.0) compared with BF% (HR=1.5) and FMI (HR=2.1). That last one really drives a pretty large nail into the coffin of body composition trumping BMI. Even when using only the more exacting body composition data (still a considerable almost 30,000 subjects), the hazard ratios persisted, and if anything became slightly stronger. The simple and inexpensive measure of BMI can be as clinically important or even more than total adiposity measures assessed by accurate and expensive methods. Physiological explanations for these findings are discussed. WHOA!!! Say what? This is one of those studies that make me go Hmmmm, that's for sure! This is by no means a comprehensive review of the literature. I'll try and follow up with more, but offer no promises. The above and one other are studies that were "suggested" in my search for Rob's study that I've also included. I was reminded of a very recent study (August 2017) that challenged the notion of "metabolically healthy obese people". While this study didn't look at body composition, the last line of the Conclusion is in agreement with the results of the body composition study. Then there's this study, which I won't comment further on (or this post never gets posted), but I'll include the abstract and the graphic that jumped off the page at me. Background: Fitness level and obesity have been associated with death in older populations. We investigated the relationship between aerobic fitness in late adolescence and early death, and whether a high fitness level can compensate the risk of being obese. Methods: The cohort comprised 1,317,713 Swedish men (mean age, 18 years) that conscripted between 1969 and 1996. Aerobic fitness was assessed by an electrically braked cycle test. All-cause and specific causes of death were tracked using national registers. Multivariable adjusted associations were tested using Cox regression models. Results: During a mean follow-up period of 29 years, 44 301 subjects died. Individuals in the highest fifth of aerobic fitness were at lower risk of death from any cause [hazard ratio (HR), 0.49; 95% confidence interval (CI), 0.47–0.51] in comparison with individuals in the lowest fifth, with the strongest association seen for death related to alcohol and narcotics abuse (HR, 0.20; 95% CI, 0.15–0.26). Similar risks were found for weight-adjusted aerobic fitness. Aerobic fitness was associated with a reduced risk of death from any cause in normal-weight and overweight individuals, whereas the benefits were reduced in obese individuals (P < 0.001 for interaction). Furthermore, unfit normal-weight individuals had 30% lower risk of death from any cause (HR, 0.70; 95% CI, 0.53–0.92) than did fit obese individuals. Conclusions: Low aerobic fitness in late adolescence is associated with an increased risk of early death. Furthermore, the risk of early death was higher in fit obese individuals than in unfit normal-weight individuals. While aerobic exercise is not known for lean-mass building, whatever the body composition changes (or metabolic ones) associated with aerobic fitness are trumped by obesity as measured by BMI. All three of these studies were rather large (60K, 520K and 1.3M) and had relatively lengthy follow-ups (15, 12 and 29 years) in populations that were healthy at baseline. As previously noted, this isn't a comprehensive review or search, but I have yet to come across a similar study of this nature that has shown a benefit to a high BMI -- irrespective of body composition. There seem to be various "obesity paradoxes" mentioned in the literature vis a vis obesity and CVD (and all cause) mortality. Basically, higher BMI, lean mass and even adiposity seems to be protective in certain circumstances. What circumstances are those? Well, these seem to be almost exclusively (please let me know of studies otherwise!) in studies involving elderly populations and/or those with existing CVD (often marked by an event and or surgery). This post started getting way too long, so I had broken this discussion out into another post. In doing so I somehow lost the second part so it may be a while, but I'll do my best to get that out quickly. When published, this link should work: High BMI and Mortality Once You Have Cardiovascular Disease. It includes a discussion of "Rob's study": Relation of Muscle Mass and Fat Mass to Cardiovascular Disease Mortality that showed reduced hazard ratios for cardiovascular disease mortality with high muscle/low fat and high muscle/high fat body compositions compared to "frail" low muscle/low fat body compositions. I have a couple of other studies in a similar vein as well to discuss. There are some rather interesting outcomes, and taken together with the studies discussed here could lead to various interpretations. I feel the need to reiterate from my summary, and numerous mentions over the years, that this is an issue where I have considerable skin in the game. I don't have any current health issues other than the joint problems (that are at least partly genetic, but also I believe "load" related to carrying around extra weight). There's a family history of heart disease on both sides, different sorts and whatnot, but as I circle the sun for the 55th time, I think more and more of how I can maximize my chances of living a longer, productive life. In 2007 I suspect my BMI hovered near, at or even over 50, and even getting down to a normal size in 2008 I weighed too much. Part of starting this blog was to determine if that was "OK" so long as I was healthy, etc. I've since lowered that BMI down below the threshold for obesity (yay! ), and am closer to a normal weight than I have been since the 1990s. I'm also physically much smaller now (let's not pick apart body parts as my shape has changed so this is not universally true) at the very same weight I was starting my sophomore year in college. As I wrote in my first post about Lean Mass, I have come to question the "obsession" with retaining FFM during weight loss. 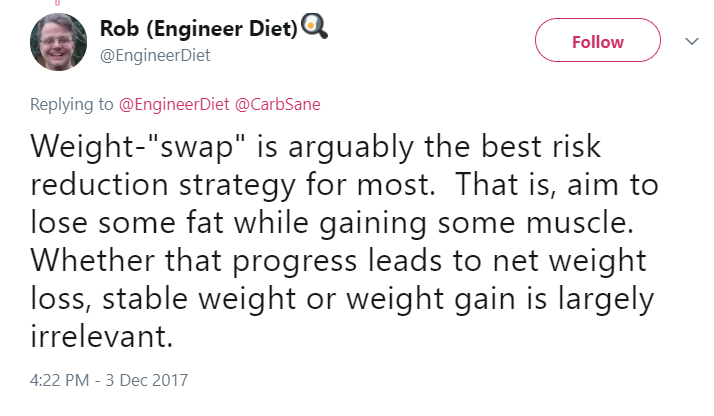 TL,DR: If someone gains 100 lbs, it's NOT all adipose tissue, so when you go to lose the weight, wouldn't you want to lose the FFM as well? My recent success has come with not prioritizing protein intake (and eating less animal protein than I used to) and letting the chips fall as they may. I was "forced" rather sedentary due to joint issues and surgery during and after my most recent weight loss, so there was little in the way I could even do to try to preserve it. In the end I didn't turn into a pile of goo, and I can lift heavy things with much the same ease as I could when I was heavier. I won't go so far as to say that I deliberately lost FFM, but I am reasonably confident that blowing right through my previous years-long plateau was because I just ate less and kept on keeping on and lost not only fat but that excess FFM. I'd still like to lose some more mass, and studies like *ALL* of the above confirm to me that this might be a healthful approach. I am, however, NOT interested in undertaking any adventures in sarcopenia, though I don't seem to have any issues in this regard either. I have good bones and I'm freakishly strong -- at least for now. I think the BMI/Body Composition study (Ortega, et.al. 2016) provides some sobering evidence to ponder as regards the benefits of resistance training for hypertrophy and/or deliberately gaining lean mass. To each his own, but I'm more interested in being strong enough to remain mobile (and compensate for my impairments in the legs department), active and productive as I age than I am in becoming Ernestine Shepherd (who totally rocks!). At this point, I've accumulated excess FFM, and the question really is, what to do with it!!??!! If you are looking to gain FFM from a lean physique, your interpretation of this study, or "take aways" so to speak, will likely differ from mine. My *intuition* says that FFM is metabolically expensive, something that is normally thought of as a positive. However in the absence of disease, whether it is the sheer weight of this mass, or stress on other organs (heart, liver, kidneys especially) to support it, extra weight of any sort seems to be detrimental (if anything) over a lifetime. Once you have disease, however, those stockpiles can help you survive a taxing event such as a heart attack or bypass surgery. If you've frail at the get go, there's just not much in the tank to support healing and survival. This makes sense to me. You? In Ortega 2016, the hazard ratios over 2 are considerable!!! Here we have a large population size even for where "gold standard" measures of body composition were used. How often do we see HRs of 1.12, 1.57, etc. For MUCH smaller samples. When you are dealing with HRs over 2, it is time to pay attention. The headlines would read "200+% increased risk ..." or "100+% increased risk ..." instead of the 12% and 57% increased risk for the two HRs I pulled out of my hat there. when using only the ~30,000 people for whom "gold standard" body composition measures were available, the HR was 3.0! But ... but ... but ... I'm muscular! Very high FFMI (fat free mass index, like BMI but using FFM to height): HR = 2.2 for all , HR = 2.1 for the ~30K people with "gold standard" body composition measures. Is there anything actionable in all of this? For me there is. I've long ago let go of hiding behind my "health". Health is multifactorial, but in the end, obesity = less healthy. It just does. My own very high BMI was WAAAAAAAAAAY over the cut-off of 32 in the Ortega study. If I were lean from a start point, there may well be reasons other than aesthetics to build lean mass. But I'm not. 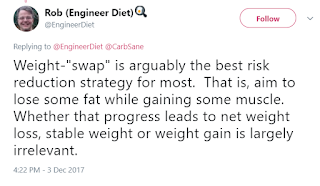 Coming from a point of excess fat and fat-free mass, MY takeaway is that normal BMI is a reasonable and health-promoting goal after all. So-called "overweight" is a more fuzzy area, but even there, clear trends emerge. Stop with the "throw away the scale" stuff ... if you carry extra fat tissue, you know who you are, and chances are even if you "carry it well" (perhaps especially so, I can relate! ), you've got extra FFM hanging on too. You don't need anything but a mirror and a scale to figure this out. Aim to reach an appropriate weight for your skeleton by eating less. Consider NOT worrying about preserving the *excess* FFM through exercise and high protein intake. Consider NOT trying to outrun or outlift your fork or trying to recompose yourself to health and fitness. Disclaimer: All of the above are "if you were a loved one and asked me for advice".